1,400 Frontier Communications workers in West Virginia and in Ashburn, Va., are on strike to keep their jobs in their communities and to fight for better service for West Virginia customers. Watch CWA member Elisha Edgell of Princeton, W. Va., talk about why Frontier workers are on strike. Read local coverage of the strike here. Top: CWA Local 1298 held a solidarity informational picket line in Meridian, Conn., and at Frontier headquarters in Norwalk, Conn., to show their support for the Frontier workers who are on strike in West Virginia and Ashburn, Va.
Bottom: CWA President Chris Shelton and CWA Secretary-Treasurer Sara Steffens joined a rally of striking Frontier workers in Ashburn, Va. Negotiations between CWA District 4 and AT&T Midwest began last Tuesday. Read the latest bargaining reports here. Members of CWA Local 4900 in Indianapolis, Ind., are ready to fight for a fair contract at AT&T Midwest. Negotiations between CWA Legacy T and AT&T began last Tuesday. Read the latest bargaining reports here. Amid allegations of systemic wage theft, Senators Bernie Sanders, Elizabeth Warren, and Jeff Merkley issued a letter last week calling on General Dynamics (GDIT), a federal contractor that operates call centers handling inquiries about Medicare and the Affordable Care Act, to ensure that the company is not illegally underpaying its federally contracted call center employees or violating its employees' rights. CWA is helping workers at GDIT join together to fight wage theft and improve working conditions. CWA has filed a complaint with the Department of Labor's Wage and Hour Division, calling on the agency to investigate systemic wage theft at more than a dozen call centers. CWA estimates that GDIT may owe tens of thousands of current and former employees more than $100 million in back wages. 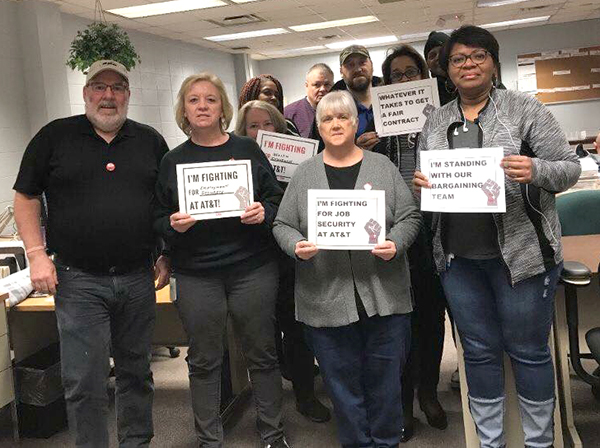 "We're not going to sit idly by and be treated as poorly as we've been treated," said Venus Nelson, an employee at GDIT's call center in Hattiesburg, MS. "We work hard, we deserve our pay, we deserve to be treated as fairly as anybody. And we're excited to have the support of Senators willing to stand with us." Watch Senator Bernie Sanders' video of his meeting with GDIT employees here. CWA is drawing attention to Verizon Wireless's plans to close six call center locations across the country, eliminating about 3,000 customer service jobs. Verizon is characterizing these closures as a necessary part of its transition to a home-based workforce at six of its 18 existing call centers. But this "transition" excuse is just an attempt to cover up the fact that these are layoffs. "Workers deserve real job security," said Dennis Trainor, CWA District 1 Vice President and Chair of CWA's Wireless Workers United, a network of union and non-union workers organizing to protect good jobs and quality customer service. "If this is not a layoff, as Verizon Wireless claims, all workers at the six affected centers should get to keep their jobs." Verizon Wireless has already closed 19 call centers since 2012, affecting 11,000 workers. And while House Speaker Paul Ryan and President Trump promised that passing the tax bill would help working families because companies would bring jobs back to the United States, Verizon continues to use third-party contractors around the world. These contractors often pay poverty wages, boosting profits for corporate executives and large shareholders. CWA President Chris Shelton spoke at the Congressional Progressive Caucus Summit in Baltimore, telling attendees that Democrats can win by focusing on raising wages, stopping the offshoring of U.S. jobs, and protecting unions and rights at work. "The Communications Workers of America and the CPC, alongside scores of allied organizations and tens of millions of Americans, are waging a war for the future of our country. This struggle has never, ever been more important," Shelton said. "It is simply not good enough for us to just say no. We have to be for a program and an agenda that puts Main Street before Wall Street, that is serious about fighting for racial, gender, and environmental justice, that is deeply committed to restoring the democracy that Donald Trump, the Roberts Court, and corporate elites have been steadily stripping away." 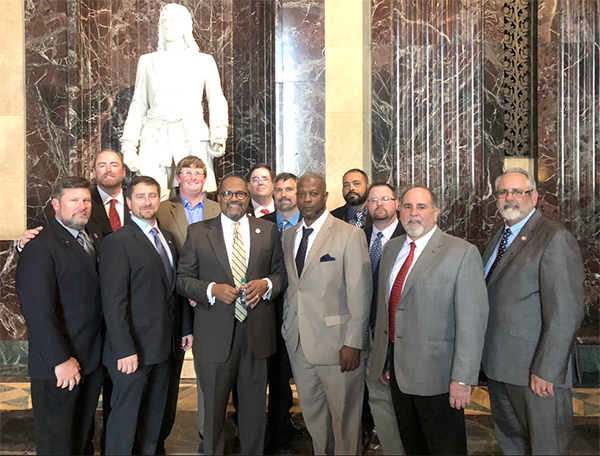 Last week, CWA local presidents from across Louisiana gathered at the State Capitol in Baton Rouge to meet with Louisiana Senator Troy Carter. Carter has introduced a bill giving the state the ability to claw back tax incentives when corporations don’t keep the employment promises they make. CWA Local 3411 president Matt Wood testified before the Senate Revenue and Fiscal Affairs Committee in support of the legislation. Front left to right: Steve Edler, President of Local 3410; Dwaine Henderson, President of Local 3403; Louisiana State Senator Troy Carter; Henry Rosenthal, Vice President of Local 3402; David Pierce, President of Local 3404; Louis Reine, Louisiana AFL-CIO President. Back left to right: Matt Wood, President of Local 3411; David King, Vice President of Local 3412; Julian Bourg, President of Local 3412; Nick Degueyter, Vice President of Local 3406; Al Guillory, President of Local 3407; and Eric McPherson, Local Rep for Local 3414. Buoyed by strong labor support from CWA and other unions, Democrat Conor Lamb won a special election in the normally strong Republican-leaning 18th Congressional District in Western Pennsylvania. Lamb ran on a strong pro-working families platform, in stark contrast to his anti-labor opponent Rick Siccone who supported so-called "right to work" legislation. CWA members knocked on doors, made phone calls, and hosted a GOTV event at Local 13000 headquarters. Don't miss the April 30 deadline! The CWA Joe Beirne Foundation is awarding 16 partial college scholarships of $4,000 each for two years for the 2018-2019 academic year. Eligible for the scholarships are CWA members, their spouses, children, and grandchildren, including the dependents of retired, laid-off, or deceased members. Applications are available only online at the Foundation's website. The final deadline for the 2018-2019 school year is April 30, 2018. CWAers, please share this information with students who might be eligible. This week, the U.S. Senate passed a bill to roll back protections that were put in place to prevent another financial crisis. The bill is the latest in a string of rewards for the banking industry delivered by this Congress. To make matters worse, Republicans blocked the inclusion of an amendment from Senator Elizabeth Warren (D-MA) that would have cracked down on the growing trend of big banks sending jobs overseas. Last week, CWA released a report detailing numerous examples of how major banks have been laying off American workers while ramping up operations overseas in low-wage countries. Despite the financial windfall the banking industry is set to gain as a result of the Republican tax bill, there is no movement from the big banks to return jobs from overseas. In fact, analysts believe that the GOP tax bill actually will encourage the additional offshoring of American jobs.